We hope that YOU will help us celebrate by participating in our One Day 50th Anniversary End to End Hike on June 2. We need 75 hike leaders, to cover the entire length of the main trail. If YOU are willing to volunteer to lead a hike, please contact Roy Dando at rdando@verizon.net. We hope to have a SIGN UP page up on the website in mid-April for those who wish to participate on that day. Those who sign up and hike a section of the main trail on June 2 will be awarded a special patch. NO extra patches will be produced, so the only way to get one is to sign up and show up. I'm hoping for 1000 hikers that day! Liz and I will be there! Another way to help us celebrate is to attend our 50th Anniversary Weekend at Keuka College on June 15-17. An excellent schedule of hikes, workshops, tours and programs has been planned. 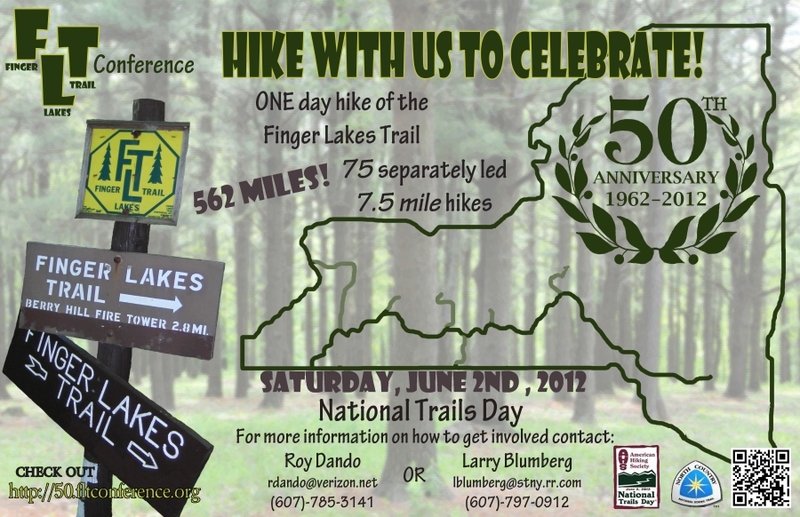 Registration materials are on our website at: http://www.fltconference.org/trails/what-s-happening/hike-programs/spring-weekend-2012/ I would like to see at least 250 people there. PLEASE JOIN US. Visit our website often to learn about ALL of the MANY new things that will take place during 2012 including, but not limited to our NEW Passports, new ED, Hiking programs, Fall Campout, interactive maps, NEW store (in April), etc. Happy Birthday, FLTC. I am proud to have been your Executive Director for 11 of those 50 years. 0 Comments to "Happy Birthday, Finger Lakes Trail"